The St. Cloud Greater Osceola Chamber of Commerce is currently seeking to fill its President/CEO position. Responsibilities will encompass the total operation of the St. Cloud Greater Osceola Chamber of Commerce. The President/CEO manages the property, business affairs and staff of the Chamber. The President promotes the Chamber in the community and builds positive relationships with members, business leaders, elected officials and the community leaders. The President is responsible for initiating, implementing and evaluation of all aspects of the Chamber activities. The successful Candidate will possess experience skills to offer strategic planning, marketing, organizational leadership, volunteer recruitment and coordination, staff leadership and direction, and demonstrate strong writing skills. The ideal candidate should have an enthusiastic and outgoing personality, the ability to speak comfortably in front of large groups of people, creativity and background in event execution and promotion. This full time, salary position reports to the Chairman of the Board and the Board of Directors. The position calls for flexible scheduling and will include some weekends, evenings and early mornings. The St. Cloud Greater Osceola Chamber is an energetic organization that serves some 500 members. Members are actively engaged in the committees, events and numerous networking functions of the Chamber. The preponderance of small business members calls for a hands-on, service oriented, personal contact approach by Staff, Board and member to member. The Chamber works cooperatively with local government and enjoys a good working relationship. Economic growth is anticipated for the St. Cloud/Harmony market due to the development of nearby Medical City, the growth of the Narcoossee Corridor, South Hickory Tree Road Corridor and expansion space at the Stevens Plantation Commerce Park. 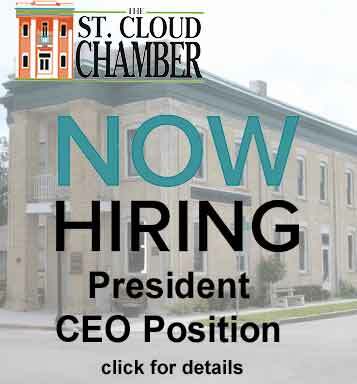 Resumes may be submitted to the Chairman@stcloudflchamber.com.